I am trying to log in to Koodo serf serve system but when I try to do so, I see the following error. 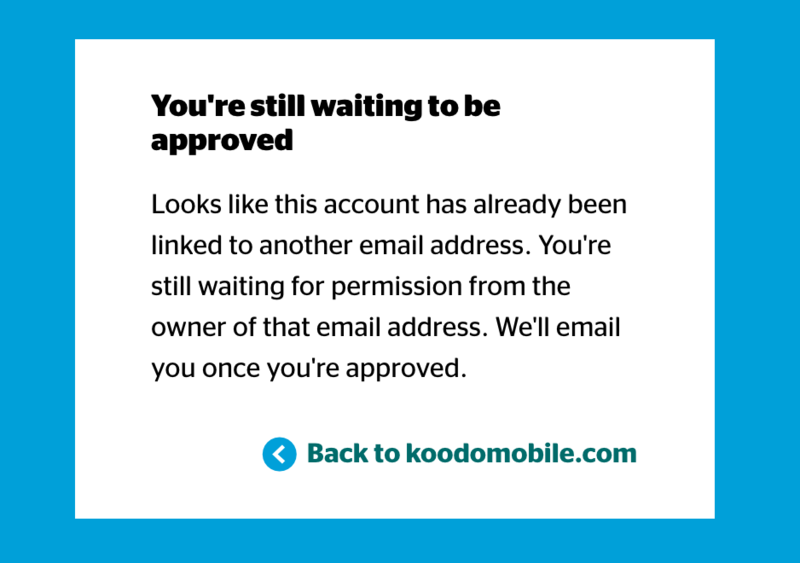 I checked a few similar posts in the community and it seems like Koodo needs to correct my email address. Could anyone with the permission please do so ? @Harry Kim Ok, let me have someone take a look. It will likely be tomorrow given but will be fixed. This cannot be done over here as this is a public forum. You shouldn't be posting your account details. Eyoull need to send a private message to Koodo via Facebook Messenger or DM via Twitter to get it sorted out. @Harry Kim Where did you buy your service? At a dealer, retail or a Koodo store? It was about 2 weeks ago right? @Goran , Thanks! I removed my account number and sent a message to Koodo facebook. @Bernard Koodo that's correct and at a dealer. Does it make a difference? They should have set you up with your self serve account before you left. would have taken 2 minutes. That would have avoided all the trouble. It looks like they spelt your email address 'happy' not 'harry'. I'm going to try delete and you will have to start your registration again. You will need your account number to do it. You have that, right? @Bernard Koodo Yes, I do have my account number and please delete the wrong email address. Thank you so much for your help. Ok, pls give it a try now. @Bernard Koodo , my email address is still registered in the system and if I log in to it, it still says, pending approval. @Bernard Koodo, I will give it a try tomorrow then. Thank you so much for your help! @Harry Kim Ok, someone made additional adjustment Harry. Pls give it another try.